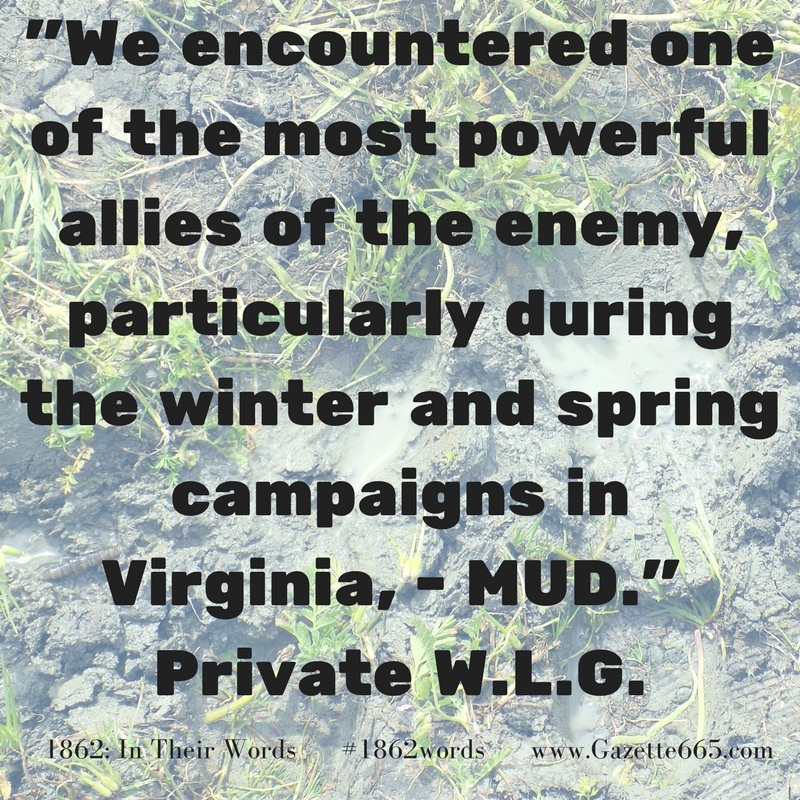 …We encountered one of the most powerful allies of the enemy, particularly during the winter and spring campaigns in Virginia, – MUD. No country equals a Virginia road for mud. We struck it thick, and sometimes knee-deep. It was very “heavy marching.” The foot sank insidiously into the mud, and came out again reluctantly; it had to be coaxed, and while you were persuading your left, the willing right was sinking as deep. The noise of the walking was like that of a suction-pump when the water is exhausted. The order was given, “Route-step”; we climbed the banks of the road in search of firm earth, but it couldn’t be found, so we went on pumping away, making about one foot in depth to two in advance. Our feet seemingly weighed twenty pounds each. We carried a number six into the unknown depths of mud, but ti came out a number twelve, elongated, yellow, and nasty. Occasionally a boot or shoe would be left in the mud, and it would take an exploring expedition to find it. Wad River declared that though Virginia was once in the Union, she was now in the mud. The boys called their shoes “pontoons,” “mudhooks,” “soil-excavators,” and other names not quite so polite. Mud took the military valor all out of a man. Any one would think, from reading the Northern newspapers, that we soldiers had macadamized roads over which to charge at the enemy. It would have pleased us much to have seen those “On To Richmond” people put over a 5-mile course in the Virginia mud, loaded with a 40-pound knapsack, 60 rounds of cartridges, and haversacks filled with 4 days’ rations. Without exaggeration, the mud has never had full credit for the immense help it afford the enemy, as it prevented us from advancing upon them. The ever-present foe, winter and spring, in Old Virginia was Mud. General McClellan had got his well-equipped Army of the Potomac to the Virginia Peninusla and then spent valuable weeks arguing with Lincoln and the War Department over the number of necessary troops. In April, he laid siege to Yorktown. When the Union forces entered the entrenchments, they found wooden guns used as stand-ins for the real artillery pieces the Confederates had removed in their retreat. 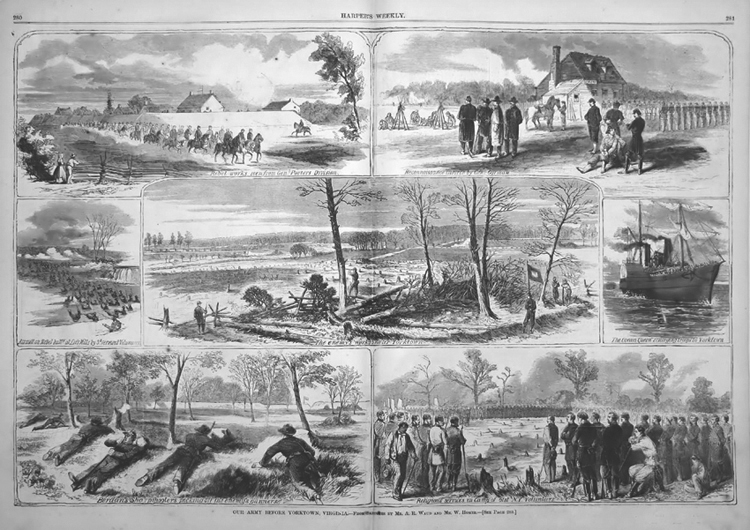 The Battle of Williamsburg took place on May 6, 1862, and McClellan happily reported to his superiors that both “battles” ended with minimal loss. Slowly, the Union army pressed forward toward its goal: Richmond, capital of the Confederacy. The weather didn’t cooperate and the roads on the Peninsula weren’t constructed for thousands of troops, presenting a problem for marches, transportation, and communication. Is weather neutral in war? That’s an open question that could be answered numerous ways depending upon your point of view. There are certainly times that weather seems to favor one side more than another, and during this part of the Peninsula Campaign, it certainly seemed to disfavor the Army of the Potomac. 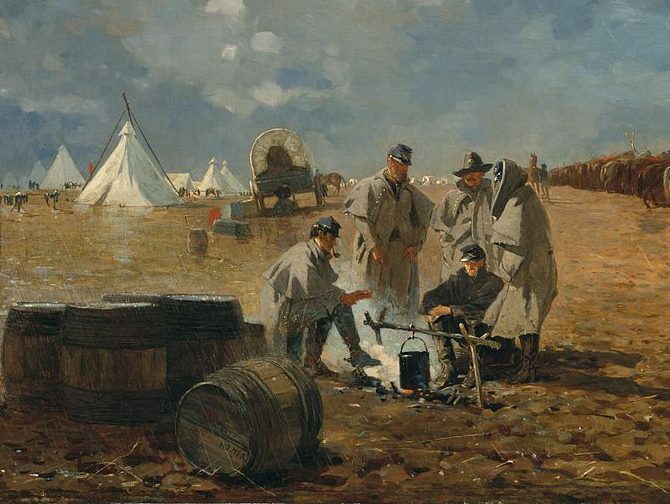 “A Rainy Day In Camp” by Winslow Homer, cropped. This artwork was created post-war, but is based on his sketches from during the Peninsula Campaign. Ironically, while McClellan continued to slow-foot his way up the Peninsula as though he was on a reluctant, uncomfortable vacation, the Confederates scrambled to assemble a significant army to defend their capital. Unknown to McClellan, Richmond and the Peninsula was still pretty close to defenseless at the beginning of May 1862…but each passing day allowed better trench construction and allowed a stronger Confederate defensive force to assemble. It’s an old question among Civil War buffs – what if McClellan had hurried? But McClellan wasn’t inclined to hurry. (He still wanted a few thousand more soldiers.) And, though leadership or lack thereof may have been the primary cause for the slow advance, the weather didn’t exactly make the advance easy…as Private Goss pointed out so vividly. P.S. Author’s note – I haven’t lost my shoes in mud (yet! ), but I have sloshed through mud that came close to my ankles at a rainy living history event. What’s your experience with mud? How does it help you relate to a Civil War soldier’s situation?